Post-its and Ponderings: Shelfari - Social Networking for Book Lovers! Shelfari - Social Networking for Book Lovers! I love books, bordering on an addiction. I don't watch movies, and I don't even own a TV, but I read more than I should. Reading entertains me, educates me, and provides an excellent form of procrastination. And it passes the time on public transportation. So, imagine my glee when a student "requested friendship" to a site called Shelfari. Now, as a middle school teacher, I have been invited to join MySpace, Facebook, IMVU, and even Club Penguin by my students. I have shied away from such social networking sites in the past, however, I have never been able to resist a good book. I checked out the site and it was love at first sight. The site allows you to track which books you have read, are reading, and are planning to read. You can give ratings, write reviews and document when you completed each book. Like most social networking sites, you can post questions to discussion boards and read others' reviews. You can also recommend books to friends. Plus the user interface is really clear and easy. At first, I thought I wouldn't want to take the time to upkeep my account, but there is something strangely satisfying about seeing all those texts sitting on my "shelf," chronicling my recent literary adventures. It is also great to add book recommendations to my "planning to read shelf" since I have often written recommendations on scrap paper, only to lose them by the time I checked out my next book. Shelfari was launched in October 2006. This Seattle startup was founded by former RealNetworks employees Josh Hug and Kevin Beukelman. "Just as Flickr was social media around photos or YouTube around videos or Digg around news, we are building the first social media site focused on people that read books," said Hug. Shelfari, like any self-respecting website, has its own blog. From their blog, I learned that Shelfari was acquired by Amazon in late August, 2008. The method is simple. When you sign up for Shelfari you are dumped into a screen that offers to send out check-out-my-books invitations to friends. The user interface is confusing and deceptive, and what seems like an attempt to continue into the site really sends out hundreds or thousands of letters to everyone you've ever known by email. Reminder-letters follow. Skipping this step requires clicking out-of-the-way, gray non-underlined text. I don't think I've had a problem with it. Perhaps I was diligent in checking the "out-of-the-way, gray, non-underlined text." Or, maybe because I don't let ANY website troll my address books for "friends" (already on Shelfari). Apparently, if you choose to do that, the site is unclear. One blog commenter says, "The thing is, I didn't even see the 600 checked names (many of whom I promised not to spam) because they were checked down below my screen, and the "Send Invitations" button right underneath your "Friends Already on Shelfari" makes it look like you're only sending invitations to those guys. Slick, slick, slick." So keep your eyes open. And just type in your friend's addresses if you want to invite anyone. I still think it is a great site. If anyone has used its competitors, GoodReads or LibraryThing, I would love to know your thoughts. 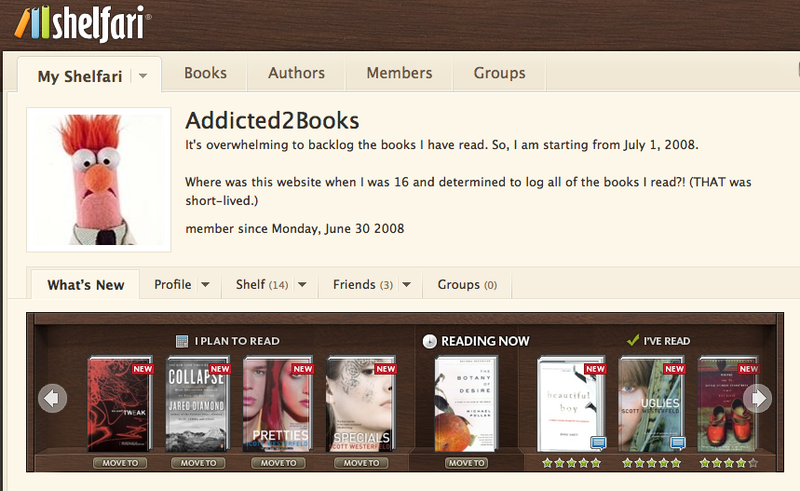 I was on the goodreads page for about a month before I quickly gave that up. I was totally embarassed that I haven't read anything (a)intelligent (b)non-textbook in a very long time. Although you can have friends, and read reviews, it didn't really seem like a social networking style of site. mostly I think it was so you knew what books you have read and how you enjoyed them. I think my experience would have been different if I read more.